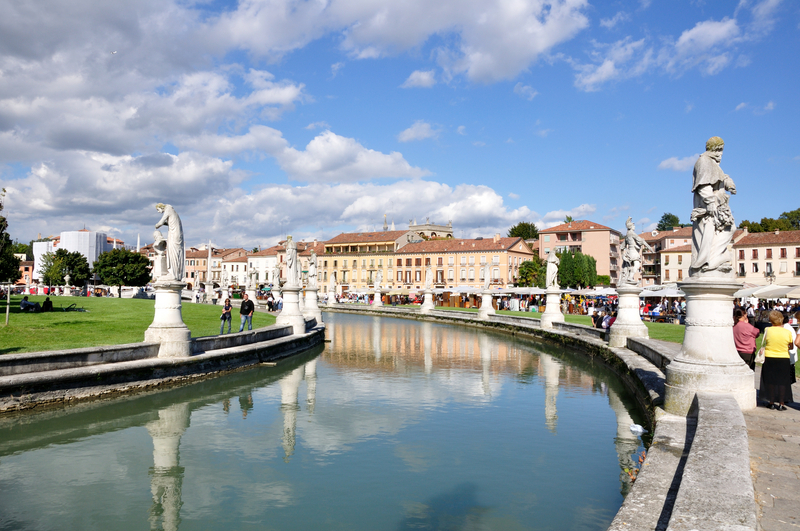 Padua is a delightful city that is easy for travelers staying in Venice to reach. To get to Padua, it is best to take the train from the Venezia Santa Lucia station or the Venezia Mestre station. The trip takes between 20 and 30 minutes. In Padua, transportation options include the tram, rented bicycles, taxis or the public bus. If traveling by bus, check the back of the ticket. Most buses issue slips that are good for two rides instead of one. This city boasts plenty of interesting sights. The Basilica of St. Anthony is an interesting structure. With its eight beautiful domes and belfries, this Romanesque-Gothic building housing the body of St. Anthony is one of the city's most popular destinations. Scrovegni Chapel is also an intriguing place. It boasts the most complete collection of entirely preserved frescoes in the world, which were all produced by Giotti. Prato della Valle was once a Roman theater and is now a site for fairs. It is composed of a large green elliptical island, four bridges, four avenues and a canal with statues of 78 famous men. Padua is also home to Bo University, which is one of the oldest universities in the world. It was founded in 1222. Elena Cornano Piscopia was the first woman in the world to graduate college in 1678, and she attended this university. While on campus, be sure to see the interesting coat of arms collection in the Bo Palace building. Padua's original law courts and the seat of the Podesta were located in Palazzo della Ragione, which was built in 1218. Be sure to see this building's collection of frescoes with religious and astrological themes. Another interesting sight in Padua is Pedrocchi. This building features ornate Gothic and Neoclassical styles. Guiseppe Jappelli designed this structure, which was unique because it featured a cafe on the ground floor and concert halls on the upper floor. The cafe is still open today, and it is one of the most luxurious dining options in town. To find the best selection of restaurants, tour the streets southwest of Giardini del Arena. Brek is a self-service restaurant, which is a great choice for groups. To enjoy authentic pizza with a spectacular waterway view, walk directly west of the park to Pizzeria Savonarola. For drinks and appetizers, try the Q Restaurant Lounge and Bar. The area is filled with plenty of other great dining venues.